Son of Lord Rupert William Ernest Gascoyne-Cecil and Lady Florence Cecil, John Arthur Gascoyne-Cecil was one of three brothers who lost their lives during The Great War. Born in March 1893, he joined Westminster School in 1905 and was admitted to Ashburnham House. Here he remained until 1912, and the following year he joined the 4th Home Counties Brigade, Royal Field Artillery (R.F.A.). This volunteer unit was based in Kent and formed part of the Territorial Force. He saw active service on the Western Front in 1914 following the unit’s conversion into a Divisional Ammunition Column, and 1915 Gascoyne-Cecil was attached to a Regular Battery of the R.F.A. He became adjutant in October of that year. However, he was keen to pursue frontline service and joined the Salonika Expeditionary Force in January 1916. The British Salonika Army was station in Salonika (modern Greece) to oppose Bulgarian advances. The following year Gascoyne-Cecil became Captain and then Brigade Major in 1918, whereupon he returned to the Western Front. It was in this posting that he lost his life. By the end of the war the Gascoyne-Cecil family were deprived of not one but three sons, as his brothers Rupert Edward and Randle William had also lost their lives. 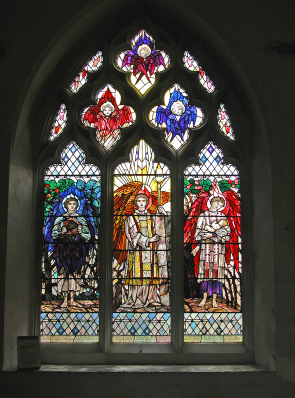 In 1920, a stained glass window was gifted to St Ethelred’s Church by James Gascoyne-Cecil, 4th Marquis of Salisbury, commemorating the three brothers. John Arthur Gascoyne-Cecil was awarded the military cross posthumously, and is buried in Ficheux, France.